Scene: At restaurant. There is a family a few tables away with a toddler girl who has wandered over to the little old lady sitting at the table next to us. We can hear them talking. Little Old Lady (to toddler girl): Why, aren't you the cutest thing I've ever seen? You are so cute! Do you know how cute you are? My son: (to me): Mom, is that lady talking to me? Me: No, sweetie. She's not. Son: I think she's talking to me. Son (shrugging shoulders): Because I'm the cutest kid in the whole wide world. Goodness gracious, it's been 2 weeks since I made a post!!?? Wowza. Well, I'm not sure if anyone is still checking in over here after my blatant neglect, but if you are, and you happen to watch the NBC show Heroes, then by all means come over and see the brand new site I started. See, I really wanted to torture myself with high amounts of pressure to commit to things I had no time for. So, I ask you, what would be more perfect for that than a whole website of my own? Exactly. The site is found here. It is part of the Quantym network that I mentioned previously. We also have a great site for you Fringe lovers. I thought I'd post the review I did of the premiere episode from last week, as I'm very excited for this weeks new episode. Episodes 3x01 and 3x02 kicked off with a three-hour Heroes-apalooza event on NBC. They started with a preview show where they did some catching up from last s eason. Some of us did need reminders of where exactly we left off. They also included some great bits from the Season 2 DVD extras that were a lot of fun to watch. The setting for the preview show was outside the Premiere party, and many of the most popular characters stood on the red carpet in front of a throng of screaming fans and introduced the clips. Some of the actors were a little wooden as they read their lines (yes, I’m looking at you, Ali Larter. I’ve seen carousel horses that were more emotive.) After an enthusiastic countdown to the top of the hour the episodes “The Second Coming” and “The Butterfly Effect” began. There were some great callbacks to Season 1. I felt it gave it a nice feeling of starting over, which, let's face it, we could use. Sylar had to (almost) start from scratch hunting down “evolved humans” after losing most of his abilities. Hiro is once again daydreaming about destiny and fiddling with the clocks. Claire is repeatedly throwing herself into harm’s way and filming it. We saw the beginning of many compelling mysteries. Is Linderman alive but invisible, or is he dead and a hallucination? Or is he dead and come back Obi-Wan style? Is Tracy Niki or is she her own separate entity? How did Daphne know to be in Hiro’s office at that very second? How did the painting of the earth blowing up get in both Africa and New York? How many people are seeing this vision? Did Ando betray Hiro like Hiro says, or is Hiro wrong just as Ando says? The special effects were stellar. How cool was that 3-dimensional trail of color frozen in time and space behind Daphne? The gore in Angela’s dream was spectacular! Claire’s decapitated remains were especially gruesome. You know, in a good way. There was more of the Heroes special brand of humor. The scene where Sylar is stopped by two of the Companies finest, filmed through the dash-cam as they make the poor decision to taze him was downright hilarious. Hiro was fun to watch as he taunted Daphne in her Parisian apartment. “Here kitty, kitty.” The talking turtle, however, was by far my favorite scene. From the moment when Usutu asks Matt if he knows Brittney Spears, I had a new favorite character. Don’t hold me to that, though. I can be fickle. I could really do without this new turn for Mohinder and Maya. Sure, his storyline was getting stale, and it’s a way to get another superpower without having to introduce yet another character, but I liked the old Mohinder. This new slimy “how you doin” cheeseball annoys me. Plus, I don’t like how suddenly the powers are based in the adrenal gland. For two seasons they have indicated that Dr. Chandra Suresh’s research and book were about the DNA of the superheroes. They have shown the powers to often be passed down along familial bloodlines. This passing out powers twist is cheap. I don’t like it and I think it’s cheating. And finally, was Mohinder going to destroy the syringe with the magic potion by incineration? Oh, no, he wants to throw it in the river. Because it’s so likely to just sink to the bottom and not affect the water or the critters living in there. I know the pollution in NYC is bad but I don’t think it can neutralize stuff that turns you into a fly. I wonder what it would do to an actual fly!? I’m uncomfortable with Nathan becoming uber-religious as a storyline. Hopefully it is a result of the “near-death” experience and it eventually fades away. It’s not that I don’t believe in God or have a problem with religious based plotlines. Believe me, I loved Highway to Heaven and Touched by an Angel. I just think that this as a story could go horribly wrong. He’ll either be made to look like a fool by the other politicians just because he is religious, or they will deify the superhumans. If it’s the former it will be a distraction. If it’s the latter, it may just jump the shark. My conclusion: I think it did more good than harm. I give it a 7.5 out of 10. It had lots of action, laughs and set up a great start for this next volume. Knowing we will have a complete season this time (knock wood) makes me look very much forward to how this act plays out. Things have been great for the leg. So great, in fact, that I have been so out-and-about that I have lost 6 lbs and haven't been sitting at my computer for as long as I used to. Which is why I hate to say it, but today is a bad day for the ol' hoof. I mean, I know why it hurts; I spent all day on it yesterday at the New Hampshire Motor Speedway. I did way too much walking. The good news is that if I don't overdo it, I can walk almost perfectly. I stopped wearing the cast last week because I discovered that the pain I was getting in my back was increasing, and I was guessing it was because I was walking all lopsided. I think my back was trying to tell me, "Look, the leg is better, walk on it already! I know it's my job to carry you, but this is getting ridiculous!" I think the last week of wearing it was just as a hard, grey, bulky security blanket anyway. I have been in PT for two weeks now and I have seen tons of improvement in my strength, flexibility and balance. I see victory over Wii Fit Ski Jumping soon within my reach! I've even been thinking it might be fun to try real skiing for the first time in decades. Maybe this will be the winter I hit the (bunny) slopes once again. Today, while I was at PT getting the massage they give to my scar to try to break it up and flatten it, one therapist said to the other, "She has a scar that's fun to play with, doesn't she?" That may have to be my Myspace page tagline from this day forward. Because of my long day yesterday, I didn't go swimming or walk today, but tomorrow when I drop off the boy, I will take a short walk, and start the swimming on Wednesday. I'm interested to see how the leg feels while doing laps. Last time I was in the water I could not propel myself with that leg, and the jiggly feeling as I kicked was just... weird. Really weird. Stay tuned to see how I did! I loved it, of course, just like all the reviewers said I would. They were also right about it being exciting at the middle and end, but a little draggy in the middle. I expected draggy, though. They had a lot of set-up to do and sometimes exposition can drag itself out. I am hoping that now in subsequent, shorter episodes we'll have more quickly paced writing. If you haven't seen the episode, be warned: this blog post will contain spoilers. As a Lost fan I chuckled to see the show open with a flight attendant chasing a nervous, sweaty man down the aisle during turbulence. Luckily it took a decidedly different path story-wise. I knew about the flesh-eating toxin before watching but man oh man was that done with jaw-dropping gore. Literally. I backed up my DVR to see the co-pilots face slide off again and again. Apparently the flesh-eating toxin was also a clothing-eating toxin as I thought it funny that some of the corpses were just skeletons. Some were clothed in photos but one just had on a tie. I hope his name wasn't Faraday. Hmm. Hey, here's a little bit of trivia; did you know J.J. Abrams wrote the opening theme song? Is there anything that man can't do? There's got to be something but it's probably a little thing like he can't make a decent omelet. The music for the rest of the episode was composed by Michael Giacchino, who is also the composer for Lost, and it is apparent to everyone that watches both shows that he uses the same type of musical cues to heighten tension. Again, it brings back flashbacks of Lost, but if it ain't broke, don't fix it. It's only helping here. "How did the plane land if everyone on board was dead?" "Oh, Logan Airport has this special doohickey that lands the plane automatically." "I accept that with no reservations as totally believable. Moving on now..."
At that moment I knew I had a choice: get annoyed and end up over-the-top critical about everything they put forward, or buy it and enjoy the ride. I chose the latter, of course, so I won't dwell, but I did think it needed to be said. The middle part, again, was all about giving us massive amounts of information and back-story, which was slower than the beginning, but compared to other shows, still excellent television. It's kind of like saying that compared to the Sistine Chapel, the Mona Lisa is a bit drab. It still sure as heck beats Dogs Playing Poker, is what I'm saying. I did not see the ending coming at all, not one bit, not one iota. But after I caught my breath again, I could only form four words in my head: LEAST GRATEFUL BOYFRIEND EVER. I mean, she went through hallucinogenic drugs, skull probes, walked around in her underwear in front of an old crazy guy, flights too and from Iraq, cow procurement, dealing with a meanie-head boss, transported his see-through hiney all over eastern Massachusetts to save his life, and he still runs her off the road? I'm starting to think he would not, in fact, do the same for her if the situation had been reversed. I love the idea that he will be interrogated post-death. The lady with the robotic arm whose name escapes me looks like she is going to be one of my favorite evil genius villian characters. My favorite overall character on the show so far? 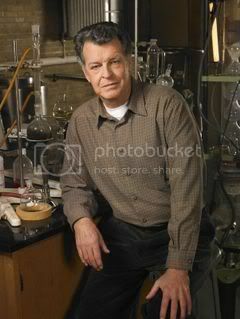 Without a doubt, Walter Bishop. I have watched the show now one and a half times, and plan on keeping it on my DVR. It definitely deserves at least another rewatch, but for now I pretty much give it an enthusiatic 8 out of 10, if only because I could have sworn it was supposed to be 2 hours, not an hour and 37 minutes. The show has made a fan out of me. They had me at "flesh-eating toxin", of course, and the rest of the show just solidified this relationship. What's Bringing Me To The Fringe Table? I really am looking forward to this show tonight, albeit with a little trepidation. I am drawn to this show mostly because I am a fan of Lost, and the J.J. Abrams connection there could very well be all the reason I need. Truth be told, I really didn't get all excited about the early ads for Fringe. 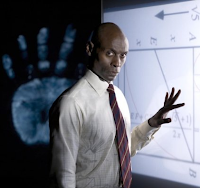 Sure, they said "from J.J. Abrams", and they featured the actor Lance Reddick but the confusing and frantically paced commercials still seemed a mite bit sci-fi-y for my tastes. Just because the two shows had a few people in common didn't mean I'd automatically like it. In fact, I haven't watched any of the other shows by Abrams. Then I started to hear that it shared a few more quirky traits with my favorite show, such as a crazy genius, an airplane and a secretive corporation. OK, I thought, but still... I don't really want a Lost Redux. Ultimately I decided I would watch the show because just about all my friends are thrilled out of their gourds about it. I figured maybe I'll give it a chance just so I don't feel left out. Then the reviews began to come in, and the show was compared to The X-Files, Bones, Twin Peaks and Heroes. I love love love all four... ok, three of those shows. Hey, I wanted to enjoy Twin Peaks but I missed the first season and was totally baffled by it when I tried to watch the second season. (Is she cradling a LOG? ...The hell?) I saw in an interview with Abrams that Fringe was decidedly not going to be one of those shows where if you miss an episode you weren't screwed and I was so relieved to hear that. I definitely couldn't handle another group of people who call me after every episode so I can explain what just happened because they had missed two or ten episodes. As has been the case with so many network dramas since Sept. 11, that 2001 attack on the World Trade Center and the Pentagon can be felt in virtually every frame of this new series. 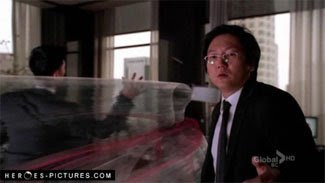 Think of Fringe as a post-9/11 version of The X-Files, with lots of pseudo-science from NBC's Heroes, and you will have a pretty good fix on the pilot for this wildly uneven but most-promising series from one of TV's most in-touch-with-the-culture creators. This is the kind of thing that I am hearing about the show that has me excited. What I am not looking forward too are the morning-after news reports that come out where all the reviewers try to make the corny pun about the ratings showing "Fringe On Top!" I will have to run over anyone who says that with a surrey. And like chicks and ducks and geese, they'd better scurry! Ok, I'll stop. I have been so bad about posting that I have actually not even looked at this site due to the shame I feel in neglecting it. The past two weeks have been a blur of school preparedness. Add to that back pain that has made anything other than breathing and eating completely unappealing and you have, well, this: The lonely un-updated blog of yours truly. 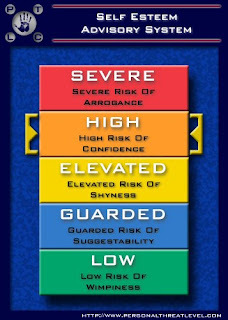 I have been writing today, and you will shortly see a blog posting I wrote for a new website about the Fox show Fringe. The site looks great and I encourage all you fans of the show to stop in and check it out. If you are a fan of Sci-Fi in general, why not visit their sister site, Quantym? Then, I will be updating The Daily Crutch, news on my boy's first week of school and other things that I am watching and hearing about. A few more quick updates: I found lemon juice at Walmart the other day, and I saw it again at my supermarket today. Unfortunately I hear from Wisconsin that a friend of mine can't find any at her markets, so maybe we're just stealing it from the midwest. And going back to one of my earliests posts, I finally got around to listening to the Dork Forest podcast (I know, I'm slow. Did you not know I'm a dork myself? It explains a lot.) Anyway, I found it hard to listen to at first because the podcasters produce it by calling into a service and that "over-the-phone" sounding voice is a little distracting at first, but the show was funny enough that I really enjoyed the program and can't wait to download another one.